“Cécile Chaminade (1857-1944) was one of the most famous women composers of her time. From her Paris début in 1877 through the First World War she maintained an active career as a concert pianist. Her most effective programs were of her own music, which was widely published (over 400 compositions). In 1901 she made a series of recordings in London for Gramophone & Typewriter Ltd. All seven of her known recordings are included here. They are scratchy and rather primitive sounding, but her exceptional piano playing is fully evident. She composed melodic music and could project a singing line along with a wide variety of pianistic colors. No one knows why she never recorded again, despite living for another 43 years. "Cécile Chaminade was essentially a composer who had a career as a pianist playing her own works with great public success. By the age of eight she was writing church music and her private teachers were Félix Le Couppey for piano, Martin Marsick for violin, and Benjamin Godard for composition. Chaminade’s family was not musical and she had private teachers because her father did not want her to go to the Paris Conservatoire. She gave her first concert at the age of eighteen and thenceforth had an extremely successful career as a performer of her own works rather in the manner of Gottschalk, a half century before. Her works are of a similar quality, in that they are beautifully crafted, aiming to please and charm their audience. Chaminade was popular in France and England; after her first visit to London she returned nearly every June during the 1890s to give an annual concert, performing her new songs and piano works, engaging friends such as Blanche Marchesi and Pol Plançon to sing them. She made her American début in 1908 playing her own Concertstück for Piano and Orchestra Op. 40 with the Philadelphia Orchestra. In addition to the hundreds of piano pieces she produced, she also wrote many songs, several orchestral suites, two piano trios and a ‘Symphonie lyrique’ for chorus and orchestra entitled 'Les Amazones'. The critics were not as enthusiastic as the audiences, and after 1899 she visited London only occasionally. At one of her last visits in 1922 she filled the large Central Hall in Westminster and played nine piano solos while the rest of the afternoon concert was devoted to her songs, and compositions by other composers. In 1901 she married a Marseilles music publisher, though he died six years later and she never remarried. In 1913 Chaminade was the first woman composer to be made a member of the Légion d’honneur. Chaminade was one of the first pianists to record for the gramophone in 1901, the fledgling Gramophone and Typewriter Company no doubt thinking her records would be an instant commercial success. Seven sides were issued, all of her own works, and today these are very rare as few people at the time had a gramophone on which to play them. All have been reissued on compact disc and the sound is remarkably clear for its age. Editions of Autrefois and Automne graced many an Edwardian piano and were in the repertoire of such pianists as Leopold Godowsky, Mark Hambourg and Shura Cherkassky. It is unlikely however that amateur performers ever played Chaminade’s works with the style that their composer did. Her fluid technique and nonchalant style of chic and charm conjure up a vision of fin de siècle Paris. Her discs exude character and an impressively brilliant technique." 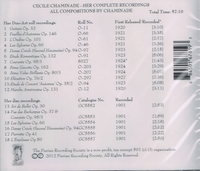 "Pierian releases all of the known and complete historic recordings of Chaminade performing her own compositions. This disc includes all six sides she recorded in 1901 for the Gramophone and Typewriter (G&T) Ltd. (the company that later became EMI), and among the rarest of all in G&T's collection. Also included are the Duo-Art roll recordings from the 1920's. They have been transferred by the most respected authority on the Duo-Art, Denis Hall, of the Pianola Institute."